I met Jeanne Cordova when she came to do a reading and discuss her memoir When We Were Outlaws: a Memoir of Love and Revolution at the Claremont Women’s Cultural Center in 2012. She won many awards and gained recognition for Outlaws. As a role model, Chicana, feminist, community organizer, journalist, entrepreneur and author, Jeanne’s legacy will live on in the many women she mentored along the way. Feminism, and particularly lesbian-feminism, was the next wave that she caught. 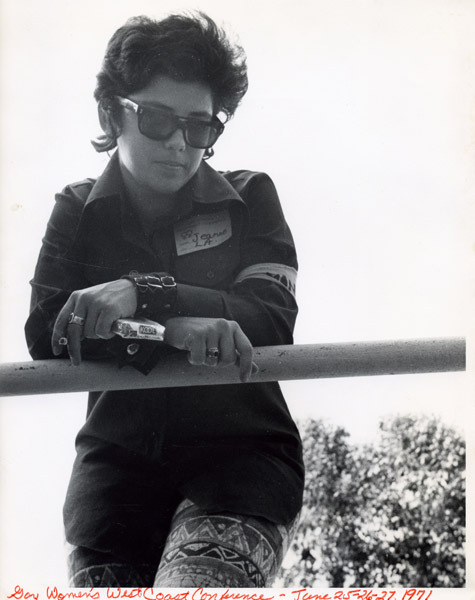 Transitioning from the softball fields of Pico Rivera to the presidency of the LA chapter of the Daughters of Bilitis, she saw the need for a publication to give voice to the new generation of lesbian feminists, and she began The Lesbian Tide, which became a national newsmagazine and the voice of a generation of lesbians. And as the gay & lesbian movement became more politically mainstream, she transitioned into the presidency the Stonewall Democratic Club and led the California state wide campaign to elect eighty-eight openly gay delegates to the 1980 Democratic National Convention. This letter is meant as a notification and thank you to the thousands of members of the national lesbian community whose activism, lives, and loves have touched my own. Especially those dykes who have become family and siblings of choice over the last 40 years. Yes, the rumors are true, I have metastasized to-the-brain cancer. I am dying from it in my cerebellum. I have had cancer since 2008. Colon cancer. For the first four years I brushed it off, as I’ve done many times with physical illness or difficulties. 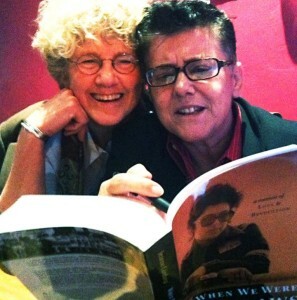 I continued my activism with the Lesbian Exploratory project and I finished my third book, When We Were Outlaws. The cancer came back in 2013. Metastasized first to my lungs and then to my cerebellum. Yes, my head. With brain and back-of-the-neck cancer it has been a downhill experience the last three years, with multiple operations, radiation and Chemo. This February I had Chemotherapy. Among a host of side-effects, it’s given me “chemo brain,” which amounts, basically, to “getting stupid.” Just saying. This month’s so-called side effect is peripheral neuropathy. That’s from Chemo, they say, and it makes your feet, fingers and hands feel tingling and numb like when you fall asleep on your leg or hands. Only, it doesn’t go away. I can’t stand up without holding onto a wall or background support. I can’t feel where my feet are. Yeek! I freak myself out talkin’ about it! How about you? A guru once told me, “We die in increments, one piece at a time.” She meant one part of our body suddenly ceases to work, an elbow or a tongue. Seemingly for no reason, like a worn out knee. This came as a surprise. I thought we get old or die…suddenly, and all at once. Not so! Many of us have gotten cancer and died. I write publicly to the women who have defined my life because I want to share this last journey, as I have shared so much of my activist life with you. You gave me a life’s cause. It is wonderful to have had a life’s cause: freedom and dignity for lesbians. I believe that’s what lesbian feminism is really about, sharing. We built a movement by telling each other our lives and thoughts about the way life should be. We cut against the grain and re-thought almost everything. With just enough left undone for our daughters to re-invent themselves. Death should be a part of life. Not hidden, not a secret, something we never said out loud. Being an organizer and journalist in the lesbian, gay, feminist, and women of color communities—and loving it–has been the focal point, of my life. It has been a wild joyous ride. I feel more than adequately thanked by the many awards I have received from all the queer communities, and through all the descriptions and quotes in history books that have documented my role as an organizer, publisher, speaker, and author. Thanks to all of you who have given me a place in our history. From the age of 18 to 21, I painfully looked everywhere for Lesbian Nation. On October 3, 1970, a day I celebrate as my political birthday, I found Her in a small DOB (Daughters of Bilitis) meeting. That’s when my life’s work became clear. 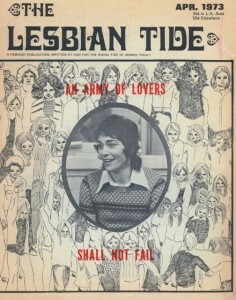 Shortly thereafter I became a core organizer for two national lesbian conferences, one of which re-directed my path to create The Lesbian Tide newsmagazine, a national paper of record, as the historians say, for the lesbian feminist generation. And on it went for multiple decades of marches and later online organizing–this time intersectionally, to include all of me and my Latina identity. I believe that cancer or any terminal disease is the luck of the draw. As my mother used to say of my Aunt who was also a nun of 90 years, “At that age, you got to die of something.” I have read the obituaries in Lesbian Connection (*2) these last years as they chronicle the passage of my 2nd wave generation. The one message that rings out clearly is that so many, many in these pages were activists who articulated social justice in their local or regional spaces. Many dykes making change. So many of you or loved ones have gone through death rituals these last years. It makes me feel like one-of-the gang … again! I really don’t know when or if I can write again. Mental competency and all that. The choice appears to be living with chemo forever off and on, or dying. I will make that choice soon enough. In the meantime, please write or speak your own truth in living with dying to your lesbian newspaper or my blog. I want to say THANK YOU to all of you who have loved another woman-identified-woman, who have loved me, or have loved Lesbian Nation. I wish I could still write about this kind of love more eloquently. Lesbians do have a special love for one another. I have felt it many times when women are with each other. I am happy and content to have participated in it for most of my very full and happy life. Least you be too sad, know that I have this kind of love not only with my family of choice, but with a straight arrow spouse with whom I have journeyed these last 26 years. Epochalips sends much love and sympathy to Jeanne’s long term spouse Lynn Ballen, and all her dear friends and family. She will be missed but not forgotten! Read more about Cordova on Epochalips here.